Buy Online Now! - High Numbers Rock Concert Posters and Memorabilia. The name change resulted from their association with Pete Meaden, a mod who briefly managed them in mid-1964 (Helmut Gorden was also involved in their management with Meaden for much of that time). 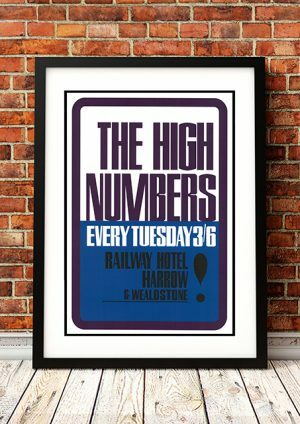 Meaden was instrumental in getting the band to gear their music and image more toward the mod movement, and this was reflected in his choice of the name “the High Numbers,” which arose from mod slang.